What Happens to Bank Holdings if the Government Shuts Down? 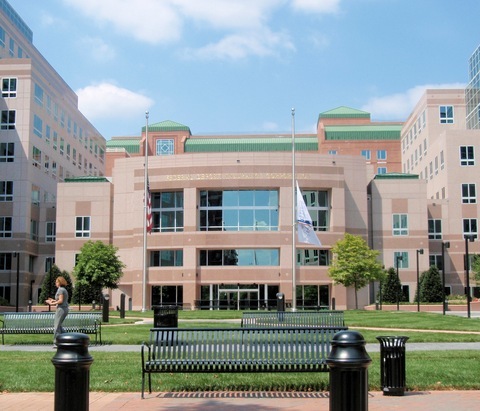 FDIC offices in Arlington, Va. Photo by Coolcaesar via Wikimedia Commons. Question: If the government shuts down, does the FDIC still insure deposits in banks? Paul Solman: Under the various can’t-borrow-any-more scenarios, past and future, the federal government doesn’t actually shut down. It simply stops performing certain functions by furloughing workers, say, or not paying certain vendors. The problem with the FDIC is not a “government shutdown” in itself, but the panic that could conceivably be induced by one. If you’ve heard it here once, you’ve heard it a dozen times: “credit” comes from the Latin verb credere: “to believe.” In a so-called “fractional banking” system like ours, only a fraction of deposits are kept on hand at any given time. The rest are loaned out — so the bank can make a profit on the difference between the lower rate it pays depositors and the higher rate it charges borrowers. The point is, if enough people believe that their bank(s) will run out of money and rush to withdraw before the rest, a bank run will result, even with FDIC insurance. Who wants to wait for the FDIC to pay them off? And you know the total deposits in U.S. banks? Looks to be on the order of $8 trillion, of which something like $6.5 trillion appears to be FDIC-insured. So if you imagine a nationwide bank run, a government which had hit its debt limit would be hard-pressed to engineer widespread, immediate bailouts. On the other hand, the Federal Reserve would almost surely jump once more into the breach. It would provide dollars to the banks as fast as it could print them. One last note. FOM$* Larry Kotlikoff of Boston University has been pushing a radical solution to our banking problems: “limited purpose banking,” in which banks would hold assets directly for depositors, much as mutual funds do, instead of taking in deposits and then lending them out at the bank’s discretion. Watch my discussion with him for more on that. The FDIC’s insured liability is $6.5 trillion and it has $3.5 billion in assets. If there were a massive run and the Federal Reserve committed to printing $6.5 trillion, this would lead people to expect hyperinflation and they would continue to run to get their money out to buy something real before prices rose. There’s lots of unstable equilibria that can arise in our economy with its man-made fragility. That’s why we need to adopt Limited Purpose Banking, which is the only truly safe banking and monetary system.